This week’s honor starts with a discovery I made very young. My grandmother Lena (mother’s side) grew up on a small Kansas dairy farm during the Great Depression. A timely (or untimely?) result of this childhood, her penny-pinching scruples were notorious. Unless a particular occasion was deemed special, she was militant about keeping food costs to the minimum. Unfortunately, this was an admirable financial trait never adopted by her grandson. When my grandparents eventually moved to Arizona several decades ago, being exposed to the vast and diverse offerings of our much-larger supermarkets (in comparison to rural Kansas at the time), Lena fell in love with one exotic item in particular⎯cheap, instant ramen noodles. Lena had a stubborn, “Midwestern palate,” but quickly became a fan of the pre-cooked Japanese noodles. In fact, she would purchase them by the basket full. This was not only my own first exposure to ramen, but also to the suburban world’s cult reaction to the budget-friendly eats (read: buying oversized quantities and hording). Every Tuesday after school was ‘visit grandparents day’. My mother would leave work early and drag me to my grandparents house for an afternoon of naggy chit-chat, Wheel of Fortune and, of course, an early evening “snack” of instant ramen. Needless to say, ramen noodles were definitely the afternoon’s highlight. Most kids received candy or baked goods when they visited grandma’s house⎯I got a bowl of ramen. In fact, some of my very first memories of cooking at all were on those said Tuesdays, sitting atop my grandmother’s favorite green-padded kitchen stool, watching and helping her prepare my ramen noodle soup. Which, at the time, I considered a very complex preparation. Fast forward a decade or two, my love of instant ramen noodles was starting to wane a bit. I became bored with them. Not because they weren’t fundamentally good, but my palate had since matured⎯I craved more bang for my cooking efforts. 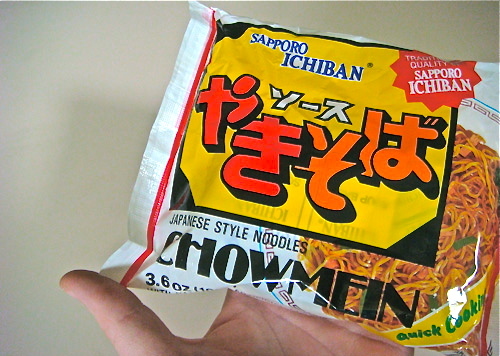 One lazy day, browsing the grocery store several years ago, I stumbled upon my current instant-noodle love: Sapporo Ichiban’s Japanese Style Noodles Chow Mein (there has to be a more efficient name). Though these are not ramen noodles (think yakisoba), they tend to fall into the same breed of foods. Packaged identically, they are both dried, instant, pre-cooked Japanese-style noodles. Unlike traditional instant ramen, which is intended to be a soup, these yakisoba-style noodles require little cooking water. The individual packages also include additional, more complex flavoring components, as opposed to what is essentially just packets of dried stock with the ramen variety. Overall, the finished product is more pan-fried side dish, than ramen’s more brothy, soupy example. In my own pantry, this item has become a considerable player in my often hectic cooking rotations. Though my grandmother Lena ultimately never instilled her budget-friendly food tenets in me, her large stockpiling and frequent usage of these instant noodles have been adopted wholeheartedly. For cooking, mix in left-over proteins, varieties of seafood, or go strictly vegetarian. These noodles can provide an empty canvass for creating a very satisfying dish, particularly when time constraints don’t always allow for more creativity. During moments of post-work inertia, a generic, consistent and comforting favorite of mine is stir-frying pre-prepared noodles with drips of sesame oil, soy sauce and Sriracha, folding in handfuls of crushed peanuts, raw bean sprouts, sliced scallions and rips of pineapple. Feeling golden, I will have prepared a lazy, well-rounded dish that feeds the stomach gracefully. My next GL award goes to these instant noodles of a very long, unnecessary name. Again, just think instant yakisoba and you’ll be just fine. Nice. Adding sauteed cabbage in particular sounds great. I’ll have to do that next time. It’s so good to know that others all over the world appreciate these noodles as much as I do. I haven’t been able to find a pack in 9 years!!! I live in Australia and Asian grocery stores have ceased to stock this wonderful noodle…for what purpose??? I don’t know. Everytime I step into a new Asian grocery store, I head straight for the instant noodle aisle, willing the pack of Sapporo Ichiban’s Japanese Style Noodles Chow Mein to be there….and it never is. So i’ve decided to see if I can find it online (I don’t know why this hasn’t occurred to me sooner) and here it is…being revered and blogged about. But alas, the places that sell it online, don’t ship to Australia 😦 Guess i’ll just have to keep looking…and hoping. Interesting that if not this exact brand, a product nearly identical doesn’t already exist in one of your local grocers. I guess that is the never-ending paradox of American “supermarkets” – there are definite advantages to their monolithic (and often generic) presence in every single community. Good luck with your search, however. If nothing comes up, I’d be more than happy to assist you ship a box of these glorious little packages your way. E-mail me a mailing addy, and I’ll gladly help out. I enjoyed your nostalgic take on your grandmother. We are lucky to have several good Asian supermarkets nearby, I keep these noodles in stock because they’re such a quick and easy meal to give my daughter between school and ballet lessons. To this day, these noodles never fail. From soups to stir-frys, main courses to side dishes, I can always find something to do with them. Nice to meet you, and big thanks for the comment. My grandmother was a great lady. I have countless such stories involving her, revolving around food and cooking. Someday, hopefully, I’ll get around to documenting them all properly.